Some of the rooms in our house renovation seem to be coming to the completion stages, so it was a bit of a shock to go upstairs the other day to go and look at the progress in the bathroom and to discover that the entire ceiling on that floor had disappeared! 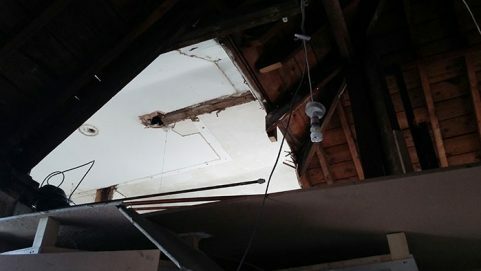 This is a ceiling that was drooping as a result of stupid decisions that the previous owners had made in the loft above, namely installing a water tank (weighing literally about a tonne) on an unsupported loft floor. 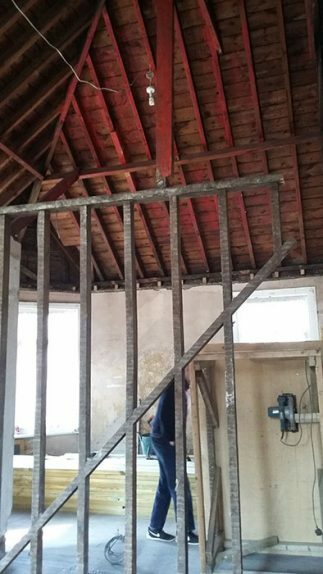 So at some point this ceiling had to be replaced, but my builder evidently got fed up with waiting for the local building authority to come and inspect the site, and took it upon himself to remove the whole lot! 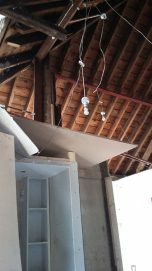 You will see that I took the photo on the left standing in the bathroom and I looked up above the beautifully constructed parts of the bathroom cupboards that had just been built to see right up another floor into the roofspace! A board had been left over the construction, just on the off-chance that it could prevent anything falling from above. The hatch that used to be the only access point to the loft (before, above left) had been ripped open to reveal a gaping hole (after, above right). 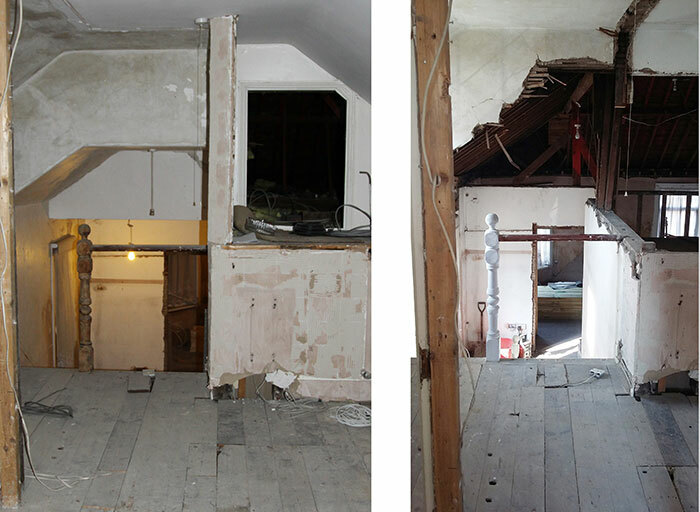 Every joist that had previously been holding up the ceiling to that entire floor had now been sawn off and removed. 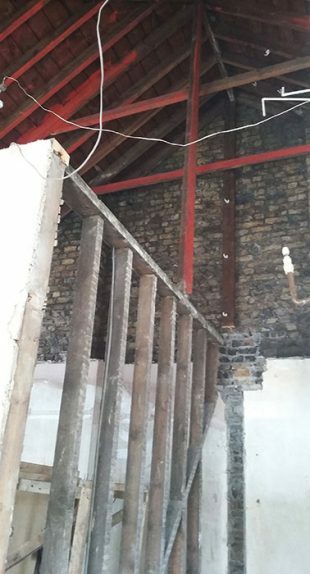 I stood in awe-filled admiration at the cathedral vault of a space that had opened up above my head, when I suddenly realised with utter horror that the entire roof was now resting on one wooden column which, as far as I could see, was using nothing more than gravity to balance on the wooden innards of the original Victorian wall below. And that line of wooden pillars had no side to side bracing, so if anyone were to fall against a pillar, the whole lot would have come tumbling down! It was Good Friday and the builders were gone, so I spent the rest of the long Easter weekend living on a hope and a prayer that nothing would slip before the builders returned on Tuesday to put in a few reassuring RSJs.